M. Kalani Souza, outgoing IKE Hui Steersperson, officiates the appointment of new co-steerspersons Kesner Flores, Jean Tanimoto, David Blumenkrantz, M. Kalani Souza (left to right), Penny Larin, PRiMO and NOAA Pacific Services Center administrative support is in the foreground. 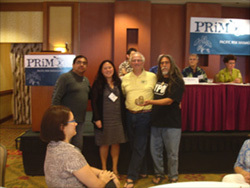 In the March blog I discussed our work with PRiMO - the Pacific Risk Management Ohana, which is a collaboration of local, national and regional agencies, institutions, organizations and academia. Over the past several years a growing number of federal agencies have begun to recognize the essential value of youth engagement and the role of rites of passage. At the March PRiMO meeting a major shift occurred. The Indigenous Knowledge and the Environment Hui (IKE Hui) chose "youth integration" through the youth and community development through rites of passage framework as its project for 2012-13. It was a great honor to be appointed "Co-steersperson" (chairman) of this distinguished group, along with Kesner Flores, Kapay Allaince and Jean Tanimoto, Pacific Services Center. In my remarks to PRiMO, I offered four arguments in support of integrating youth into all civic preparedness and the rationale for rites of passage as the mechanism to do this. First, I shared that a high school student, Angela Zhang, discovered a potential cure for cancer. Her interest in biology, coupled with supportive mentors and access to a laboratory gave her the necessary resources to unleash her creativity. Since then 15 year old Jack Andraka won first prize at the Intel International Science and Engineering Fair for inventing a cheap and effective "dipstick-sensor" method of testing blood or urine to identify early-stage pancreatic cancer and other diseases. What might be possible if young "energetic & interested" youth were engaged with scientists in all levels of research in every area of science? Second, the latest neuroscience on the teenage brain, recently labeled the "adaptive brain," affirmed what we all know. Adolescents see the world differently. They are uniquely able to perceive the world in creative ways providing unforeseen solutions to persistent problems. This innate capacity is specifically designed to challenge adults' ways of thinking in order to help us adapt to a changing environment. Adolescent's challenging curiosity serves our survival. That may be of little comfort for parents of adolescents! Third, the recommendations in the April 2010 Climate Change and Children in the Pacific Island report to UNICEF Pacific, by the Nossal Institute for Global Health, University of Melbourne included building the capacity in youth to be able to participate in community planning, preparation, protection, response and recovery necessary to involve the social, economic and environmental sectors of the community. Youth's civic engagement can stimulate collaboration between social, economic and environmental sectors for whole community civil preparedness. The energy and creativity of children and young people must be nurtured so that they can actively take part in shaping their environment, their societies and the world they will inherit. Providing youth with the skills and knowledge necessary to plan for and respond to the dangers posed to their societies by natural disasters. Fourth, PRiMO members were well aware of the role that teenage males who are initiated into cultural organizations on American Samoa, played in response and recovery from a recent tsunami. They were acknowledged to make a major contribution in preventing loss of life. Their initiation gave them a great sense of responsibility for their community and the capacity to make a significant contribution in times of great peril. That, in fact, is the history of human beings. After all who among us is more powerful and able to respond to disasters and emergencies than youth? They have physical strength and mental agility to bring power and creativity to any eventuality we may face. These arguments were offered within the context of FEMA's recently released alert: A Whole Community Approach to Emergency Management: Principles, Themes, and Pathways for Action, December 2011. In it, Craig Fugate, FEMA administrator described today's realities in congressional testimony as follows: "Government can and will continue to serve disaster survivors. However, we fully recognize that a government-centric approach to disaster management will not be enough to meet the challenges posed by a catastrophic incident. That is why we must fully engage our entire societal capacity." In this light, and with the collaboration of PRiMO and our other Hui partners, the IKE Hui, focused on Youth Integration, which they believe would provide valuable contributions. And those contributions may be no less than viable strategies for the survival of human beings and the planet. It gives further support to my own twist on a familiar proverb: "It takes a whole child to raise a village." Finally, IKE Hui members reviewed and discussed the 20 elements/principles in the architectural structure for youth and community development through rites of passage. There was consensus that the principles were aligned with indigenous education practices and the way values and ethics are transmitted that set forth expectations for behavior. And that this behavior was essential for survival of their culture and community. Unlike any other "rite of passage program," which is oriented around and promotes one cultural view, this model offers principles to guide the creation of all cultures' community-based rite of passage experience. One of the primary values that needs attention is for insuring the safety and survival of communities. 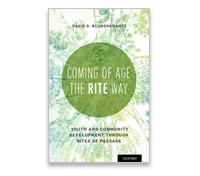 It returns attention to my question: "What if youth were the prime responders to disaster? What would adults have to know and how would they transmit this knowledge?" The traditional methods for doing this were rites of passage. What might be possible now that was not possible before? A copy of the IKE Hui report is downloadable on the IKE Hui web site in the "CURRENT PROJECTS": section. Youth - Citizen Corps for Community Capacity (Y4C). Project plan for the IKE Hui activity, Youth - Citizen Corps for Community Capacity, from the March 2012 Pacific Partners' Meeting. As a side note - within a week of our meeting, which deputy director of FEMA Tim Manning attended, FEMA announced nominations for a National Youth Preparedness Council. SHIFT IS HAPPENING!